M 1982 two-piece combat uniform, jacket and pants, 1980s. M 1982 two-piece combat uniform, jacket and pants, 1980s. 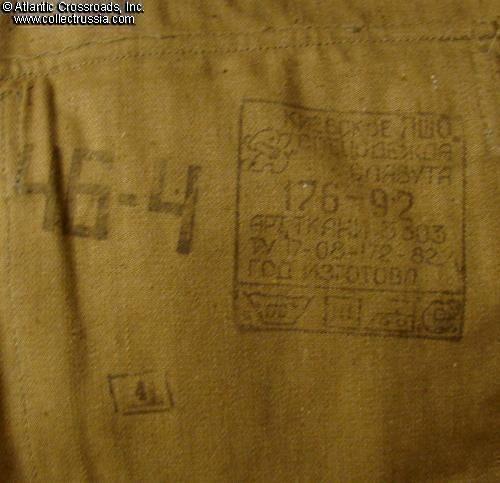 This uniform is usually called Afganka because of its widespread use by the Soviet army in Afghanistan. In olive drab cotton. 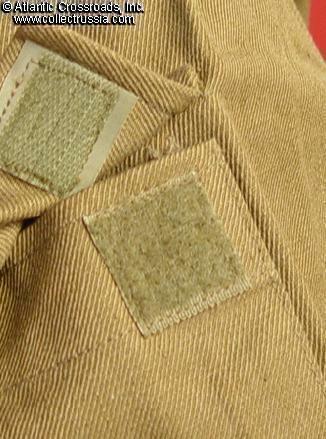 Jacket has integral combat shoulder straps in the same material, an internal breast pocket, and sleeve pockets with Velcro fasteners. There are integral drawstrings on the waist and bottom edge for tighter fit. 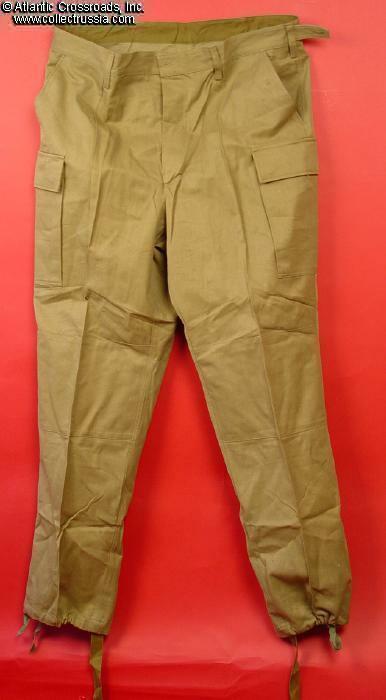 Trousers have drawstrings at the cuffs and external cargo pockets on the thighs. Very well made and practical field garment! 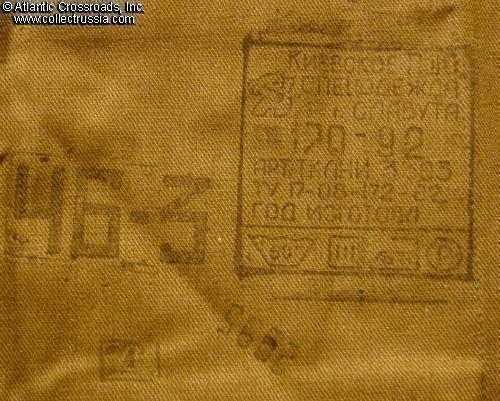 Both the jacket and pants show Soviet maker stamp of a garment factory in Kiev, Ukraine, and the 1982 manufacturing standard code (GOST). Several sizes available. Please choose from the following and please specify when placing your order by entering the size you want in the comments field. (1) Russian size 46-2 (Extra Small). The jacket has about a 36" chest, 22" sleeves (shoulder seam to cuff), and length from top of collar to bottom hem 28"
About a 30" waist on the trousers and about a 29" inseam and 39" total length. (2) Russian size 46-4 (Extra Small). 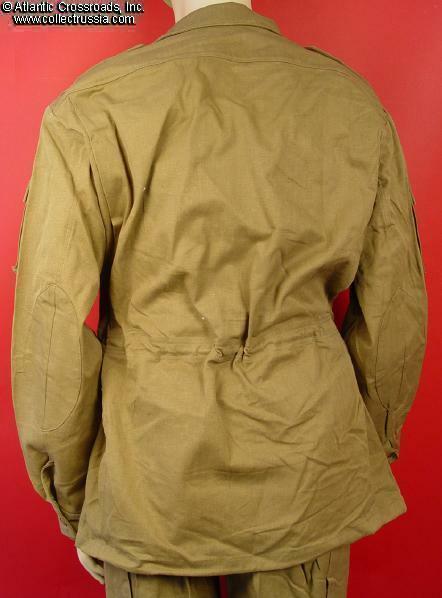 The jacket has about a 36" chest, 23.5" sleeves (shoulder seam to cuff), and length from top of collar to bottom hem 30"
About a 30" waist on the trousers and about a 32" inseam and 43" total length. 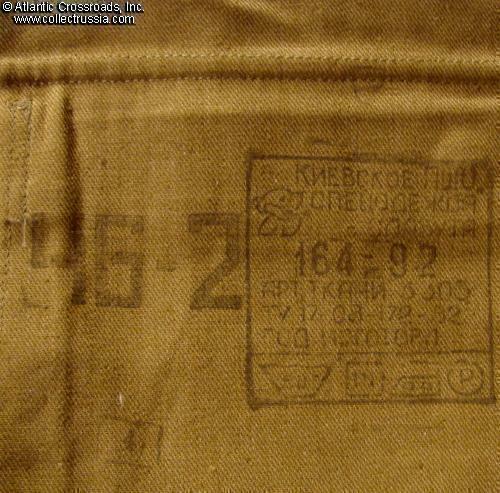 In mint condition, UNISSUED Soviet era military surplus showing only storage age. Crisp, fresh, and immaculately clean, this uniform is completely free of stains or mildew smell that so often plagues items from uninsulated Soviet military warehouses. All the buttons are present. 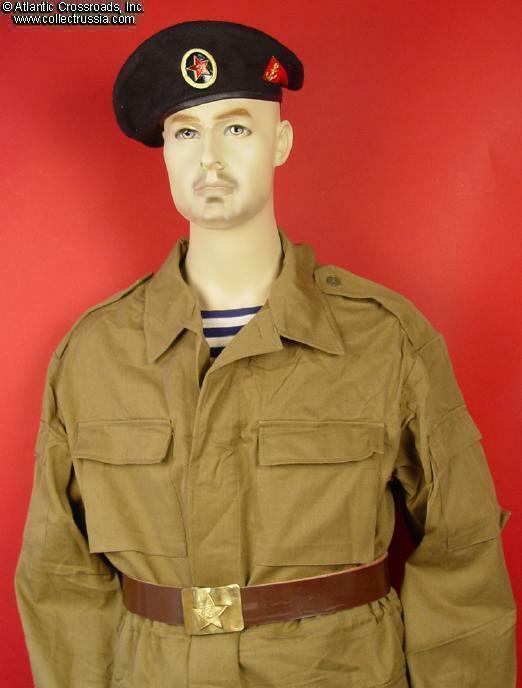 Due to its nearly universal issue to Soviet troops during the war in Afghanistan, this uniform may be the essential basis for a complete display of your Soviet Afghan war camouflage suits, gear etc. Note: jacket and pants only; the belt, striped T-shirt and cap are not included but may be available separately.